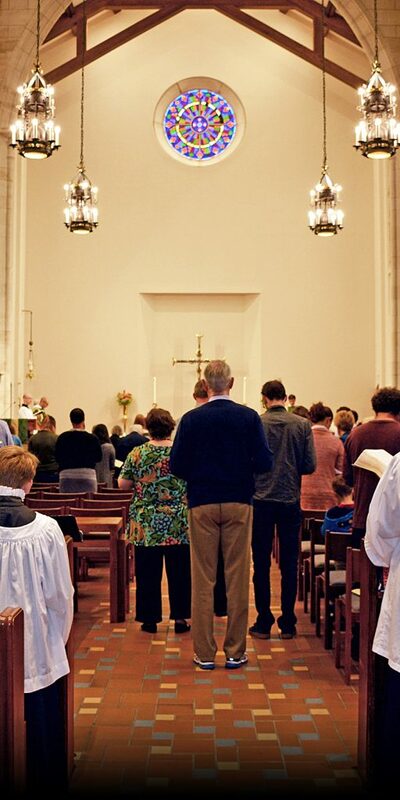 An hour-long meditative service of Holy Eucharist using contemporary English (Rite II from the 1979 Book of Common Prayer) which includes 2 readings, a sermon, and Holy Communion (Lord's Supper, Eucharist, etc.). All Baptized Christians (regardless of denominational background) are invited to receive Holy Communion. An hour-long, musical, festive, family friendly service of Holy Eucharist, which includes 3 readings, a sermon, and Holy Communion (Lord's Supper, Eucharist, etc.). This service is followed by refreshments in the Canterbury House, next to the Chapel. The Chapel invites you to remember the needy when you are filling your shopping cart. We encourage women of the Chapel who are interested in spiritual development and social justice to join the ECC. Originally formed as an Episcopal Church Women’s group, ECC members wanted our name to highlight our focus. The name, Experience Christian Community, was influenced by Bishop Doyle’s book, A Generous Community, as it conveys our intention to help build community within and outside the church based on Christian beliefs. We hope to enhance our experience of Christian community by getting to know each other well while working together and with others in the Chapel to do good in the world. ECC meetings are held on the third Thursday evening of the month. For more information, contact Joyce Wright jcwright117@gmail.com, Kay Mulhall ksemulhall@gmail.com, Ann Prisland afprism@aol.com or Lorraine Crummey alicebetsy1@gmail.com.